The spiritual person is he who partakes of and participates in the energies of the Most Holy Spirit; he, who has himself become a dwelling place of the Holy Spirit. This does not constitute an abstract, emotional or intellectual spirituality. The bearer of Orthodox spirituality par excellence is the Saint who is revealed through his teachings and his relics. The non-spiritual individual, who is deprived of the Holy Spirit, is the psychological and carnal person. It is precisely the above distinction which points out the difference between Orthodox spirituality and other “spiritualities”. 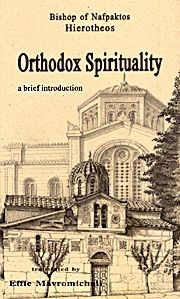 Orthodox spirituality differs markedly from the “spiritualities” of the East and the West. The difference in the dogma generates the difference in ethos as well. The essence of Orthodox spirituality lies in its therapeutic effects. It cures a person’s infirmities and renders him and integrated person. Softbound. 100 pp.